The Rosetta spacecraft is scheduled to land on the Churyumov-Gerasimenko comet on the 12th of November. Rosetta has been steadily making its way through space for the past decade and it is now finally in a position to do some serious probing. Like something straight out of the Armageddon movie, Rosetta caught up with the Churyumov-Gerasimenko comet, also known as comet 67p, a couple of months ago. The plan now is for Rosetta to launch its' Philae lander to land on the comet and learn about its' make up to see if amino acids and elements familiar to us on Earth are present. The man in charge of managing the Philae lander gave a stark insight into the challenge Rosetta and Philae face on November 12th by saying "The comet is a beautiful but dramatic world. It is scientifically exciting but its shape makes it operationally challenging". This is not least the case due to the comet bounding along in space at a whopping speed of 40,000 mph. The precise landing site was chosen back in September and has been given the operational title Agilkia. The site is approximately 1km square in area but includes some treacherous terrain with cliffs and large boulders very real impediments to a successful landing. Agilkia is located on the smaller side of the comet which has been deemed to be the easier side of the fast moving comet to attempt a landing. The Philae lander will be launched from a distance of 22km at 8am GMT on the 12th and it will embark on a 7 hour journey towards the Agilkia landing site. If it hits the landing spot accurately, it will then attempt to attach to the comet through footscrews which will drill into the surface to act as anchors. 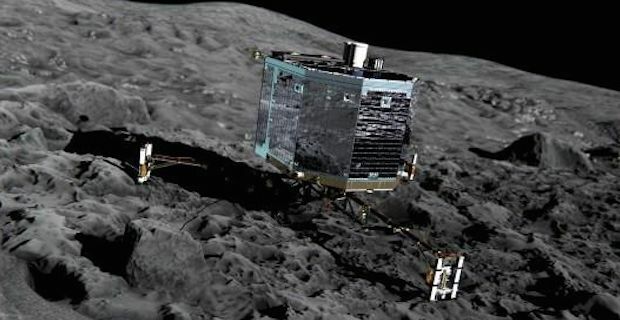 If the landing is successful then the Philae lander will get straight to work and carry out a number of investigations into the makeup of the comet. It is armed with a number of drills, sensors and cameras ready to explore things like temperatures, elements and rock formations. It will also take panoramic photos of the environment and relay them back to Earth via Rosetta, which all the while will continue to monitor the comet as they continue their journey around the sun together.